Turkish prosecutors have opened an investigation into the disappearance of a missing Saudi journalist. Jamal Khashoggi, a critic of Saudi Arabia's Crown Prince Mohammed bin Salman, has not been seen since Tuesday, when he entered the Saudi consulate in Istanbul. Turkish sources quoted by Reuters and the Washington Post say they believe he has been killed inside the consulate. They did not give any evidence for the claim, nor suggest how he was killed. Saudi officials have not yet commented, however a source at the consulate - also quoted by Reuters - described the accusations as baseless. The source added that a security team had arrived in Istanbul to investigate Mr Khashoggi's disappearance. Earlier, Prince bin Salman told Bloomberg News that Turkish authorities were welcome to search the building. Turkish media said prosecutors were now looking closely at the case, although this may be a widening of an inquiry begun on Tuesday. 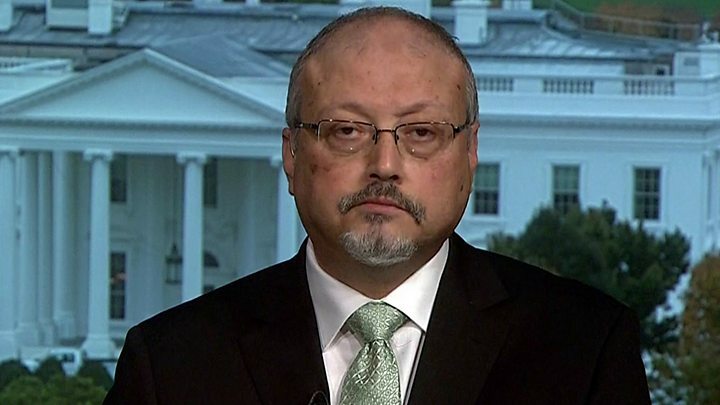 The two unnamed sources said on Saturday that the initial assessment of police was that Mr Khashoggi had been killed at the consulate. "We believe that the murder was premeditated and the body was subsequently moved out of the consulate," one of the sources told Reuters. A source quoted by The Washington Post said the journalist was killed by a 15-member Saudi team sent "specifically for the murder". 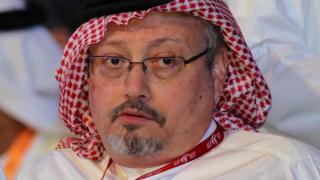 The BBC's Mark Lowen says that, if confirmed, the state-sponsored murder on Turkish soil of a high-profile Saudi dissident would worsen already strained relations between Turkey and Saudi Arabia. Turkey has taken the side of Qatar over its blockade by Saudi Arabia and other neighbours, and Turkey's rapprochement with Iran has riled the government in Riyadh. Reuters earlier quoted the Turkish ruling party as saying the investigation would be comprehensive and that the government's sensitivity about the case was at the "highest level". The AK Party said Mr Khashoggi's whereabouts would be uncovered. The head of the Turkish-Arab Media Association told the New York Times that Turkish police officers providing security for the consulate had checked their security cameras and did not see the journalist leave on foot. But Turan Kislakci added that diplomatic cars had been seen moving in and out. On Wednesday, the Turkish foreign ministry summoned Saudi Arabia's ambassador and asked for an explanation about the disappearance. Prince bin Salman told Bloomberg: "He's a Saudi citizen and we are very keen to know what happened to him. And we will continue our dialogue with the Turkish government to see what happened to Jamal there. "My understanding is he entered and he got out after a few minutes or one hour. I'm not sure. We are investigating this through the foreign ministry to see exactly what happened at that time. "The premises are sovereign territory, but we will allow them to enter and search and do whatever they want to do. If they ask for that, of course, we will allow them. We have nothing to hide." Mr Khashoggi went to the consulate to obtain a document certifying he had divorced his ex-wife, so that he could marry his Turkish fiancée, Hatice, who went with him to the building and waited outside, but did not see him leave. She said that he was "stressed and sad" that he was forced to go to the building. He was required to surrender his mobile phone, which is standard practice in some diplomatic missions. Hatice said he left the phone with her and told her to call an adviser to Turkish President Recep Tayyip Erdogan if he did not return. She said she waited for him outside the consulate from about 13:00 (10:00 GMT) until after midnight and did not see him leave. She returned when the consulate reopened on Wednesday morning. Why might Saudi Arabia want to hold Khashoggi? The 59-year-old journalist is one of the most prominent critics of the crown prince, who has unveiled reforms praised by the West while carrying out an apparent crackdown on dissent, which has seen human and women's rights activists, intellectuals and clerics arrested, and waging a war in Yemen that has triggered a humanitarian crisis.